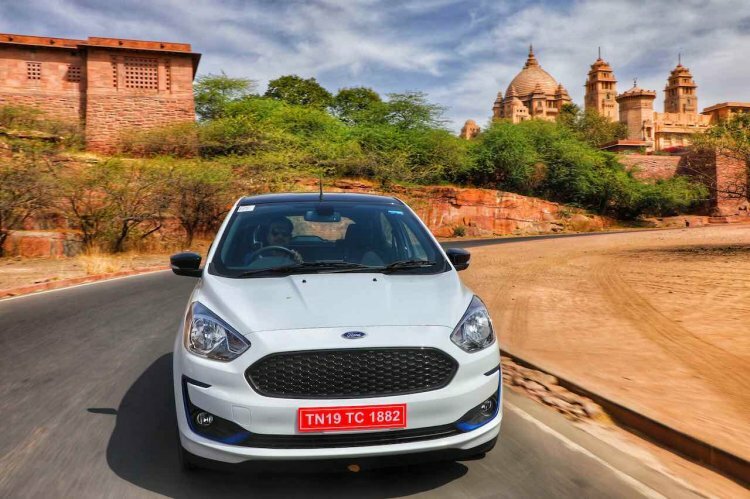 With a monthly sales average of 119 units (Sept 2018-Feb 2019), the Ford Figo is among the least popular models in its category. 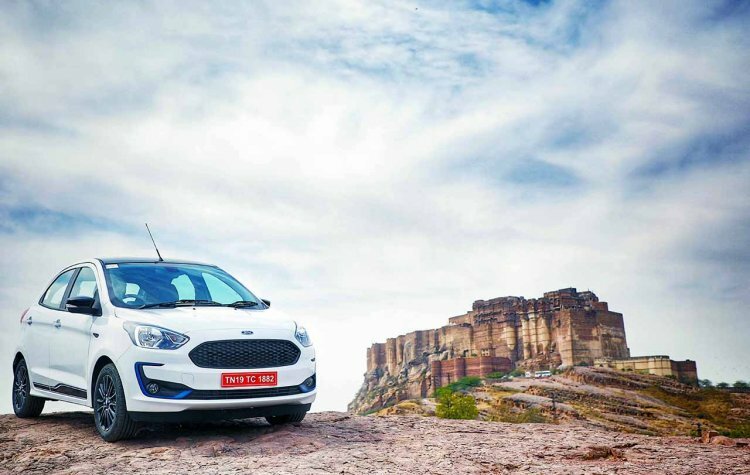 That said, Ford India is far from giving up on its B1-segmenter as the small car has finally received some mid-cycle action that not only aims to spruce up the looks but even brings in a punchier set of petrol engine options and a handful of additional features. In line with its compact sedan sibling, the Figo has received a set of updates that is far from a minor nip-and-tuck treatment. 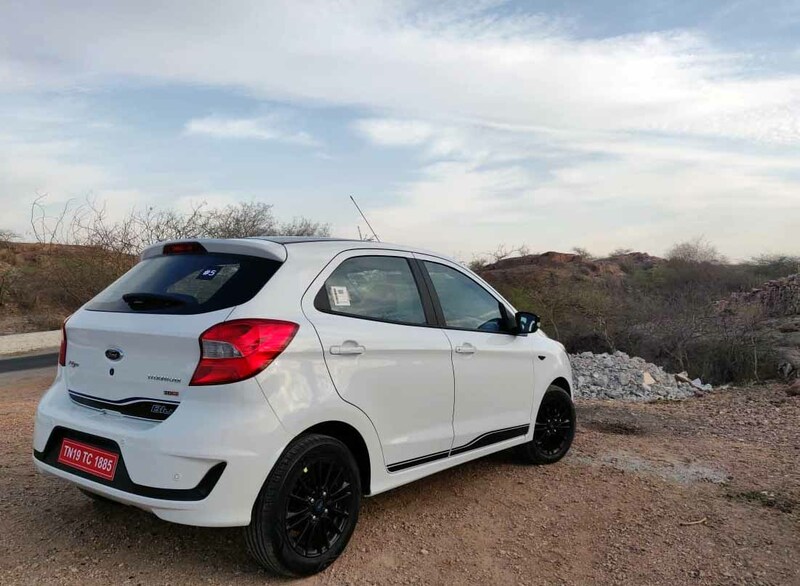 Our 2019 Ford Figo (facelift) review sums up all there’s to know about the reinvigorated Maruti Swift and Hyundai Grand i1o adversary. The Ford Figo has been repurposed on the lines of its international brethren, the 2018 Ford Ka+. The front fascia no longer sports a distinctly Aston Martin-like livery and instead comes with a sporty-looking honeycomb wire-mesh grille. The bumper is new, too, and looks a tad more sophisticated owing to a sleeker airdam and stylish C-shaped trim around the foglamp housings. Even the headlamps have been updated with black inserts to look bolder. The new model has gone on sale in three trims - Ambiente, Titanium, and Titanium Blu. The new range-topper seems to have taken inspiration from the now-defunct Figo S and features several black elements and body decals that make it look racier. The side profile remains mostly similar to that of the outgoing model, except for the availability of black-painted 15-inch multi-spoke alloy wheels and lower-body decals for the Blu trim. At the rear, the Figo gets a set of revised tail lamps, while the bumper has been updated to complement the revised unit at the front. The top-spec trim even gets a black decal on the boot lid. The biggest highlight of the interior is an updated dashboard that is similar to that of the Freestyle. The revised panel carries a floating-type touchscreen infotainment unit that replaces the primitive dot-matrix display of the previous model's SYNC system. That said, the company has stayed away from offering the excellent SYNC 3 unit and instead, has chosen to provide a low-cost 7.0-inch Fly-sourced unit that doesn't offer either Apple CarPlay or Android Auto. The entire system is nowhere as intuitive or as lag-free as the SYNC 3 unit of the Aspire. Moreover, the inbuilt satellite-guided navigation application isn't as accurate as the Google Maps app. 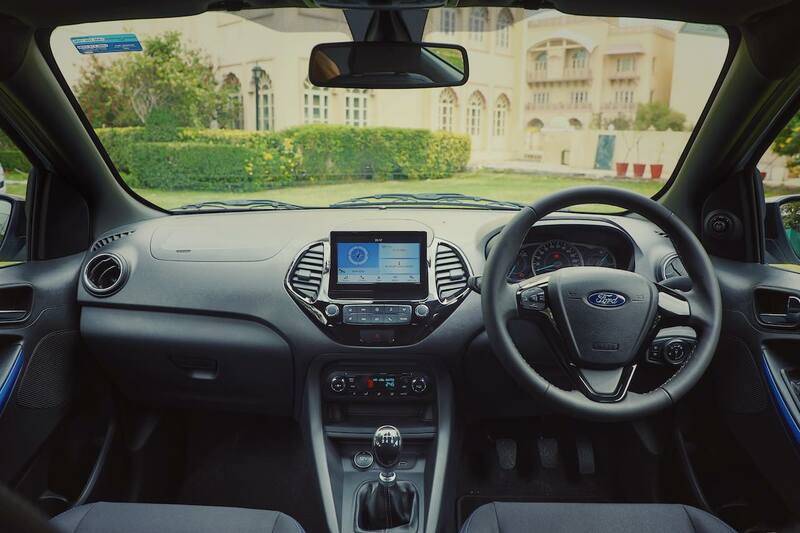 The 2019 Ford Figo has the longest wheelbase in its class, which ensures there's enough leg space for all the occupants. Additionally, there are as many as 20 storage spaces around the cabin to keep the knick-knacks. The Blu trim even gets a blue-coloured interior trim to complement the blue highlights sprinkled on the exterior. Yet another welcome addition is the introduction of the keyless start/stop system, which enhances the overall user convenience a bit. 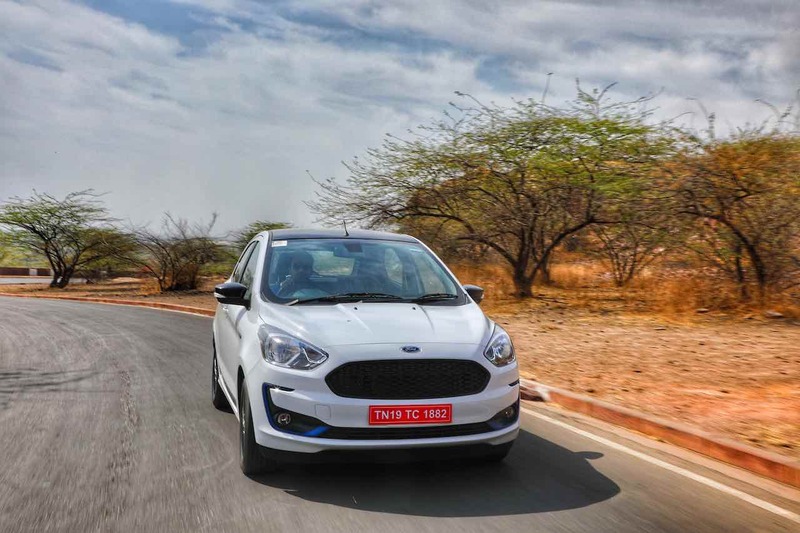 The 2019 Ford Figo (facelift) receives two new petrol engines in the form of 1.2-litre and 1.5-litre three-cylinder units from the company's Dragon range of motors. The smaller of the two options produces a maximum power of 96 PS and a peak torque of 120 Nm, which makes it the most potent naturally-aspirated car in the category. 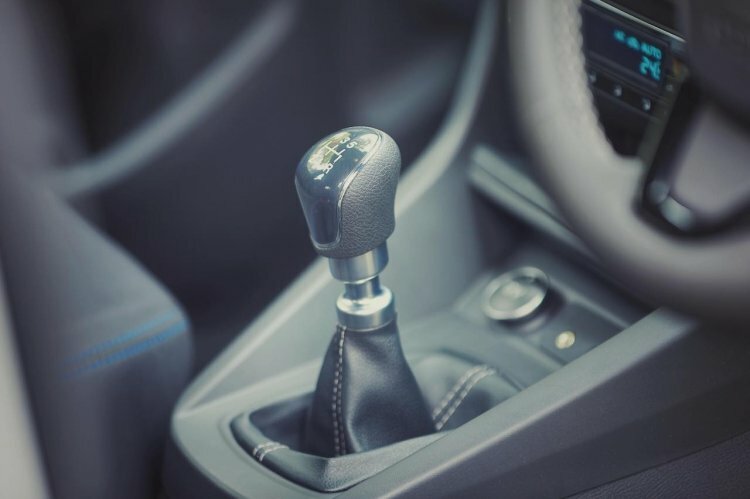 The earlier version's IB5 five-speed manual transmission has made way for a Getrag-sourced unit that offers smoother, more reassuring shifts. The ARAI-rated fuel efficiency stands at 20.4 km/l. On the go, you'll be quick to notice the improved low- and mid-range performance that the entry-level engine variant of the Figo offers. Unlike the previous motor, which felt a tad too sluggish, the new motor feels considerably peppier. That said, the on-road performance is hardly a reflection of the 'best-in-class' power output. The torque delivery could have been a tad stronger, especially below 2,000 rpm, which could have helped the car fare better in the stop-go urban environment. Things improve substantially once you are past 2,500 rpm mark as the car pulls cleanly till roughly 5,700 rpm. While the same unit felt surprisingly refined for a three-cylinder unit on the Aspire, the refinement levels of the updated Figo stand a notch lower. The petrol automatic variant is propelled by a new 1.5-litre three-cylinder motor that makes 123 PS and 150 Nm, which is a notable improvement over the 110 PS/140 Nm output of the outgoing model's four-cylinder 'Sigma' engine. The new motor delivers an ARAI-rated fuel economy of 16.3 km/l, which is slightly lower than the equivalent configuration of the pre-facelift model. The dual-clutch transmission of the earlier version has been replaced with a 6-speed torque-converter unit. We intend to drive this variant in the coming weeks and come up with a detailed report on our driving experience. The diesel version continues to get its juice from the tried-and-tested 1.5-litre motor that produces 100 PS and 215 Nm. It comes mated to a 5-speed manual transmission and offers an ARAI-rated fuel efficiency of 25.5 km/l. The tried-and-tested motor delivers is a grunty performer once the engine speeds rise above 2,000 rpm. While there's a noticeable turbo lag at the lower-most segment of the rev range, keeping the motor above, say, 1,500 rpm rewards you with a strong performance. Plus, the clutch action seems to have become lighter than before, thereby making crawling in the city a lot less stress-inducing. As always, the Figo manages to strike the right balance with the ride and handling characteristics. While the latest-gen Figo has received some flak from the enthusiasts for not offering the surefootedness of the previous generation, it's still among the most dynamically-sorted vehicle in its price segment. The company has fine-tuned the suspension to accommodate the bigger 15-inch wheels, and like before, the most affordable Ford car in India offers excellent high-speed stability, minimal body roll, and decent grip levels in the corner. The steering wheel feels sufficiently light at low speeds but gains some weight as the speeds rise. The suspension irons out most of the undulations with quite an ease and keeps the occupants unperturbed on most road surfaces. We even drove over a dirt road, but even the slightly bigger of the undulations failed to upset the composure of this car. The 2019 Ford Figo (facelift) looks bolder than the pre-facelift model and even gets a set of new petrol engines that are both more powerful and more frugal than the motors they have replaced. Moreover, the small car also gets some additional features that lead to better user experience. The icing on the cake, however, is courtesy of the highly competitive pricing. The new model has gone on sale in a price bracket of INR 5.15-8.09 lakh (ex-showroom, New Delhi), which means the new model is up to INR 70,000 cheaper than the outgoing version. The 2019 Ford Figo is even available with a segment-best 5-year/1,00,000 km warranty and the lowest cost of ownership. Other than a slightly sluggish low-end performance from the 1.2-litre petrol engine and the mediocre touchscreen infotainment unit, there's really little that should keep you from putting your money on the updated small car.